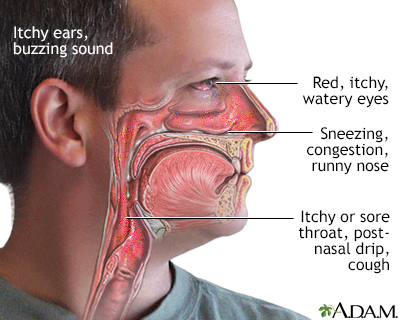 The immune system normally responds to harmful substances such as bacteria, viruses and toxins by producing symptoms such as runny nose and congestion, post-nasal drip and sore throat, and itchy ears and eyes. An allergic reaction can produce the same symptoms in response to substances that are generally harmless, like dust, dander or pollen. The sensitized immune system produces antibodies to these allergens, which cause chemicals called histamines to be released into the bloodstream, causing itching, swelling of affected tissues, mucus production, hives, rashes, and other symptoms. Symptoms vary in severity from person to person. 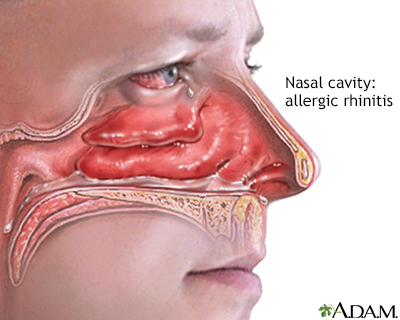 Allergic rhinitis, or hay fever, is a collection of symptoms, predominantly in the nose and eyes, to allergens such as dust, dander and pollen. The sensitized immune system produces antibodies to these allergens, which cause chemicals called histamines to be released into the bloodstream, causing itching, swelling of affected tissues, mucus production, hives, rashes, and other symptoms. Symptoms vary in severity from person to person. Blooming flowers and blossoming trees are signs that spring has arrived. But for some people, those blossoms and blooms are also signs that allergy season is under way. And that means months of sniffling, sneezing, and runny eyes ahead. You may know that you have allergies as soon as you step outside on a spring day, eat peanuts, or pet your dog. Signs of an allergy may include trouble breathing, teary eyes, hives, itching, or vomiting after you come in contact with your allergy trigger. 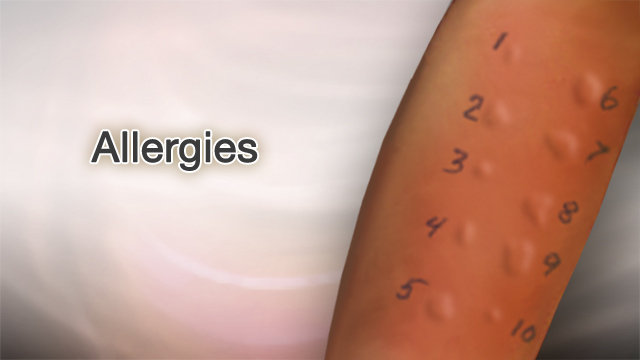 Your doctor can also do allergy tests to find out whether you're allergic, and what triggers your allergies. The most common type of allergy test is a skin test. The doctor puts a small amount of different allergy-causing substances under your skin. Then you wait for signs of a reaction, like swelling or redness. You might also have blood tests to check for chemicals that are related to allergies. 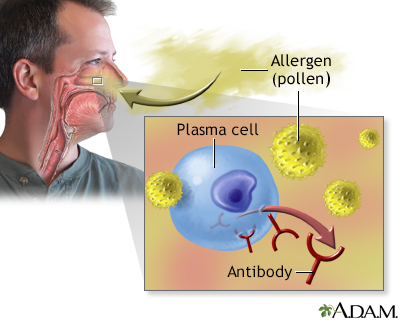 So, how are allergies treated? There are a few medicines you can buy at your local drugstore or your doctor can prescribe to treat your allergies. Antihistamines prevent histamine chemicals from triggering allergy symptoms. Decongestants shrink swollen blood vessels throughout your body, including inside your nose, perhaps helping you breathe easier. Steroid drugs reduce swelling and inflammation. And Leukotriene inhibitors block the substances that trigger allergies. If your allergy is really bugging you, your doctor may give you allergy shots. When you take allergy shots over time, eventually they can help your body get used to the substance so you don't over-react to it in the future. Usually you can relieve allergies by taking medicine and avoiding whatever it is that triggers them. But in some people, allergies to insect stings or certain foods, like peanuts, cause a life-threatening reaction. This is called anaphylaxis. And if you have a life-threatening allergic reaction, call immediately for emergency medical help.